You have been a champion of an important new approach to Musicology and to the understanding and teaching Music History: Aesthetic Realism. Clearly, it has profoundly informed your scholarly activity, including as to the Classical Era. Can you tell us more about this, including about your studies with its founder, the eminent American poet and scholar Eli Siegel? Thank you for asking. Let me begin by saying that I see Eli Siegel's definition of beauty as the greatest philosophic and cultural achievement of the 20th century. «All beauty,» he explained, «is a making one of opposites, and the making one of opposites is what we are going after in ourselves.» This definition gives what the centuries have searched for: the explanation of what beauty is in all the arts. It shows the true relation of Art and Life. It also makes possible something completely new in music education: a way for people to learn technically from the music we care for how to have lives that are good. For example, take what might be the most famous music from the Classical Era: the opening of Beethoven's Fifth Symphony. It is passionate, yet controlled. There is a torrent of energy joined to notes which hold firm. It has enormous abandon, yet at the very same time it is so precise. Isn't this what we are hoping for? Don't we want the equivalent of this in our lives? As Eli Siegel said in a 1951 lecture: «There is not one thing music does which does not say something about how a person should organize himself, too». The logic of Aesthetic Realism about the relation of Art and Life thrills me, and has thrilled me since I first met it decades ago. I was 14, and read Eli Siegel's The Aesthetic Method in Self-Conflict, a chapter from his larger work Self and World, which is published by Definition Press. I remember, in my teenage enthusiasm, saying right after I read it: «This explains everything!». Well, here I am, a bit more than 50 years later, and with a great deal more scholarly and artistic experience... and while likely I'd use different words to express my opinion, I have that opinion more firmly than ever: there is no book greater than Self and World if one wants to see what the human self truly is; nor any work which explains more deeply the meaning of art. I'll quote a passage from The Aesthetic Method which I love: «Beauty has not been respected sufficiently. The word beauty, even today, has a delicate, frail ring to it. If you talk about beauty, you are regarded by many as not being tough-minded. This should stop. Beauty has to be seen as complete logic, good sense carried further than usual: resplendent sanity». This is so important. For example, a person can feel that when they are tender, yielding they are not the same person as when they are tough and assertive. Literally, we can seem to ourselves and others like two different people. A person can likewise feel that to be exact and logical, he has to keep his emotions out of it. Or to have a passionate time, he has to put his critical intellect aside. These divisions gives us pain. But the setting off of one opposite against another, and at the expense of the other, is exactly what art never does. For example, in Mozart's 40th Symphony, assertion and yielding, exactitude and passionate intensity, are beautifully together. Art, I learned from Aesthetic Realism, embodies the integrity and good sense we want; it is «resplendent sanity». Another core principle of Aesthetic Realism is: «The world, art, and self explain each other: each is the aesthetic oneness of opposites». We come from the world; its substance is our substance. Because of this, I learned, we need to do all we can to like the world in order to like ourselves. Eli Siegel's grand principle provides the logic for this: it shows the unbreakable connection between who we are, what the world is, and the beauty of art. It is also crucial for our happiness to study what Aesthetic Realism explains, for the first time, is the unconscious ethical debate which goes on in everyone: Is it better to respect the world and other people, or to look down on them and feel superior through having contempt for them? «There is a disposition in every person,» wrote Eli Siegel, «to think we will be for ourselves by making less of the outside world.» And he wrote: «The greatest danger for a person is to have contempt for the world and what is in it, despite its aesthetic structure». Contempt weakens our minds; it stops us from finding value where it authentically can be found. Music stands for the principle of respect, and is a constant criticism of the contemptuous way of mind. For example, when a person has contempt, he asserts himself at the expense of other people and the world. This doesn't happens in successful music. A good composer takes the diversity of sound, the diversity of instruments, and gives it form. Nothing is diminished: every note helps every other note in a melody; every movement helps every other movement in a symphony. Difference is cared for, not scorned. And this is equally true – is it ever! – for the art of performance and improvisation: you express your own part, your own voice, your own very personal feeling, and simultaneously you blend with, fit in with, every other part and are moved by the feelings of the other musicians around you. This is the ethical message music has. It is a message very much needed now – in my own country, and across the world. In my opinion, Aesthetic Realism provides Musicology with something it never had before: a methodology completely free of cultural bias and limitation. That is because it is a way of seeing music which begins in a bedrock manner, with what is logically prior to any individual culture. That bedrock – the oneness of opposites – is the permanent metaphysics of the world. Motion and rest; diversity and unity; separation and junction: these are aspects of what reality always is. Every culture is based on, and also illustrates, the great fact that reality itself has an aesthetic structure. So does every instance of music. An essay on this subject which I co-authored with the noted anthropologist Arnold Perey is Aesthetic Realism: A New Foundation for Interdisciplinary Musicology, which was presented at the 2004 conference of the European Society for the Cognitive Sciences of Music: edgreenmusic.org/1-ESCOM.htm. We show that whatever its genre, or century of its origin, or the society which gave it birth, music always attempts to answer humanity's deepest need: to like the world on an honest basis by seeing its aesthetic structure. As a musicologist – let alone as a composer – my gratitude to Eli Siegel for showing this is enormous. I studied with Eli Siegel from 1974 to 1978, attending Aesthetic Realism classes he taught in New York City. It was right after I had completed my undergraduate studies in music and philosophy at Oberlin College. It was the honor of my life that he accepted me as a student. He had greatness in three fields. He was great as an artist, a scholar, and in terms of human kindness. In the hundreds of classes I attended which he taught, there was consistent intellectual honesty, beauty in his words, and the never-failing presence of good will. Wrote William Carlos Williams: «I say definitely that that single poem, out of a thousand others written in the past quarter century, secures our place in the cultural world». Williams wrote that in 1951; when Hot Afternoons appeared as the title poem of a volume of Eli Siegel's poetry in 1957, that volume was nominated for a Pulitzer Prize. I said earlier that when I studied with Eli Siegel, every class was beautiful: there was a depth of human kindness simultaneous with scholarly precision. I can give an example. It was a class in 1975, which I remember with large gratitude. In it, I learned how – without my having known it – I had a way of seeing people which interfered with my expression as a composer. I was not yet 24. And my way of seeing music and my family was unfortunately representative of many young musicians. Though I had studied hard in ear-training classes to listen to music well, I had made up my mind that there was nothing of any importance I could hear from my parents. This, I learned, was contempt and it was against art. EG: I don't see a relation. ES: Do you think that music is an attempt to take different things and show that they can work together? EG: Yes, I see that. ES: And if you show a lessening of harmony in one field, do you think it has some relation to a lessening of harmony in other fields? ES: You don't want to think about your parents because you think it will interfere with your comfort. But the whole history of music is to get to something uncomfortable and show that there is something harmonious there – and particularly modern music. One we decide to be contemptuous of anything it can work even in a field where we think we are fervent. So, would you say that when you dismiss the reality which is your parents you are caring for the reality music tries to describe? ES: As soon as you insult any reality, you insult reality as such; and reality as such is what you want to see as an artist. What a wonderful, grand education I was getting in the relation of art and life! Also in the essentials of harmony: the fact that when harmony is successful, it is a oneness of difference and sameness, disagreement and agreement – of sounds which discomfort us and sounds which soothe. Of course, I had had years of technical study in harmony before this 1975 lesson. But never once in my classes at Oberlin, or in any textbook I ever read later, was the subject of harmony actually, pointedly made useful to my life. Up to that moment, it might as well have been abstract sonic engineering – and I am afraid it is still largely taught this way. Consider the subject of dissonance. Why, in music, is a well-placed dissonance such a welcome thing? It has to do with life: we need to oppose complacency in ourselves, and perhaps in others – and to do so with good will. Criticism that is kind is against a person and for that person at the same time. We question someone, even sharply, with the hope to respect that person more: to encourage him or her to be in a fuller, richer, more exact relation to the world. Now, a good non-chord tone does the same thing! – it questions the sounds around it so that they can be more vibrantly connected to what came before and what will come after. Think, for example, of the third measure of the Molto Allegro of the Overture to Don Giovanni and that marvelous D# in the key of D major. Perfectly beautiful, and perfectly dissonant! And it certainly helps everything around it. I'd also like to mention another publication in that journal: an interview I gave in 2015 with the renowned flutist Barbara Allen. In a vivid, thoroughly engaging way, she says things about music education, instrumental education, and life itself which every musician should know. Along with the singer Anne Fielding, who is an Obie Award-winning actor, we teach a class at the Aesthetic Realism Foundation titled The Opposites in Music. We've been doing so since 1980. Here's the URL to the interview with Barbara Allen: hejmec.eu/journal/index.php/HeJMEC/article/view/55/51. There's a great deal more to say about the value of Aesthetic Realism, including how it sees science. All the sciences show that reality has an aesthetic structure: that it is the oneness of opposites. One of Eli Siegel's major books, not yet published, is titled The Aesthetic Nature of the World – and it shows the underlying kinship of the sciences and the arts. Though Eli Siegel died in 1978, his work has been carried forward by Ellen Reiss, the Aesthetic Realism Chairman of Education, and the faculty of the Foundation. Its website is aestheticrealism.org/ You can find writings there not only by Siegel but also by teachers and scholars in a wide range of disciplines who base their work on his great philosophy. I study in classes Ellen Reiss teaches; they are profound in their scholarship, beauty, and ethics. She is a true poet; in my opinion, she is without peer in the world today as a critic of that art. She also lectures on a large range of other subjects, including history and contemporary happenings. As a teacher myself, I'm inspired by her example. I've also benefitted personally many times in her classes. I'll mention an instance: some years back, in a class she taught, she dealt with the meaning of melody in music and its relation to two of the largest ethical matters in life: integrity and sincerity. It was a discussion in which I learned about my own attitude as a composer towards melody: how the desire to be impressive, rather than to see what I truly felt, hurt my music. The impact of that class was deeply useful to me as man and musician. In fact, I've had the opportunity to talk to many other composers in the years since about what I learned in that class, and they were grateful to Ellen Reiss for having defined the problem so clearly. It is easy – oh, so easy – without realizing it, to go after impressiveness rather than sincerity. Now a question about Haydn. Apparently, he was very jealous of his scores and his methods of harmonic and composition treatment. Your scholarly work, especially regarding his use of the technique of Chromatic Completion has been pioneering, and has unveiled some previously unknown aspects of his Art. Would you explain Chromatic Completion and its place in Haydn's work? And in a more general way, what are your fundamental conclusions as to Haydn's place in music history, and the enduring value of his work? In addition, you are on the Editorial Board of Haydn: The Online Journal; what have been the main challenges and goals of this important project? My largest work concerning chromatic completion is the doctoral thesis I wrote in 2008 for New York University, Chromatic Completion in the Late Vocal Music of Haydn and Mozart: A Technical, Philosophic, and Historical Study. It's available through Inter-Library Loan, or from Pro Quest (available here at Pro Quest: search.proquest.com/docview). I've also published various articles on the subject; several are online. Before I point to those articles, let me indicate swiftly what chromatic completion is, and why it matters. We have in western music twelve basic tones: the chromatic aggregate. Seven of these, in any given key, are diatonic. And chromatic completion occurs when – against that diatonic background – a composer gradually unfolds all twelve tones and then brings emphasis to an important structural or emotional moment in the music by having the final tone, the twelfth and completing tone, arrive at just that moment. Often in a vocal composition chromatic completion happens on a dramatically – even theologically – significant word. In a moment, I'll give an example from Haydn. But I want to preface the example by saying how important it is, when looking closely at any musical technique, not to separate it from feeling. Technique arises from feeling, I learned from Aesthetic Realism. It is true for chromatic completion: as I show in my thesis, many composers used the technique without being aware, just so, of it. With some however – most notably Haydn and Mozart – it was conscious. But Haydn and Mozart never employed the technique coldly; there was always an expressive reason for it. It has a sixteen measure orchestral introduction. The first non-diatonic tone, Gb, appears in measure 5. (We are in the key of Bb major). In measure 10 we hear E natural; in measure 12, Ab and Cb. All that remains to complete the unfolding of the chromatic aggregate is the tone which most plainly contradicts the underlying major key: the flattened third. Where does this Db appear? At the sudden entrance and passionate outburst of the chorus in measure 17 on the words Kyrie eleison... Lord have mercy. It is a moment at once bold and convincing. Chromatic completion helps give that boldness solid logic. The technique of chromatic completion, I believe, has an ethical source. We all want to have integrity. We want to be complete, to be everything we can be and ought to be. We also need – for our own good opinion of ourselves – to see the world and other people with the fullness they deserve. Chromatic completion arose from this. It is a symbolic, technical expression of something deep in the human mind. It is technique impelled by profound emotion. And it doesn't just happen in the Classical Era, although that period is where we find it most consciously employed. I have seen instances of chromatic completion in music from Bach to Puccini, from Richard Rodgers to The Beatles. And If you have access to JSTOR, I wrote at length about the Chaos Prelude in Donald Francis Tovey, Aesthetic Realism, and the Need for a Philosophic Musicology. You'll find that essay by looking up the Review of the Aesthetics and Sociology of Music Vol. 36, No. 2, pp. 227-248. Every year as I study music, I'm seeing more about what impels it. I'm learning new things about how ethics and aesthetics explain each other. You asked about Haydn's place in music history, and the enduring value of his work. Both are enormous. I don't want to sum the matter up swiftly, but one thing is very clear: What we find in the motto of the French Revolution, we find technically in Haydn's music – only decades earlier. It has to do with his beautiful part-writing. He gave each part in an instrumental ensemble a new Liberty. The parts have independence, uniqueness. Unlike what we see in a good deal of earlier 18th-century composition, there is Equality in Haydn's parts. In his quartets, for example, the first violin is not necessarily always in the lead. Anyone can have the main melody at any moment; there is no fixed or rigid hierarchy. Meanwhile, all the parts gracefully interlock and help each other. So there is also Fraternity – the feeling: «You are different from me, Brother, and you help me!». 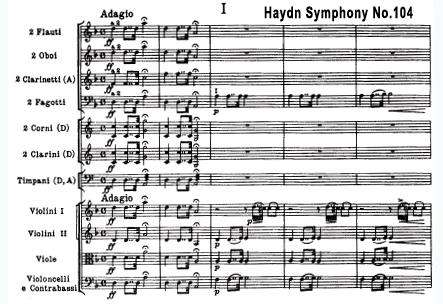 This matter of Haydn's way with part-writing is important aesthetically. It is also important from a strictly historical point-of-view, because it illustrates the ethics that were growing clearer and clearer, more and more insistent, throughout the 18th century: the ethics which would culminate in the 1789 revolution. 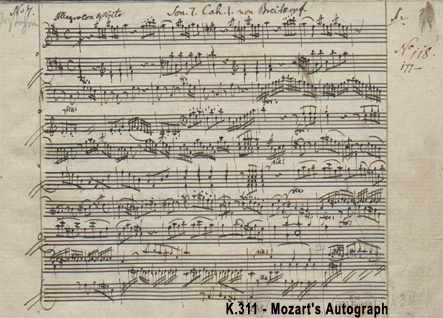 Mozart learned from Haydn about beautiful part-writing (and much more). So did Beethoven. So, did every sensitive musician of the time and the next generation. The impact of Haydn on Rossini is obvious in his nickname: Il Tedesco. Haydn's impact on Glinka is unmistakable as well – and I could name many others. As for the Haydn Society of North America, I'm proud to be associated with it. Let me salute Dr. Michael Ruhling, professor at Rochester Institute of Technology. He was the one who first felt the crying need for a journal having Haydn as its central focus. Ruhling's hard work, over many years, is what made Haydn, the online journal of the Society, possible. What is our greatest challenge? Having the musicological community more widely aware of the Society and its journal. So I'd like to use this interview to encourage more scholars to submit their essays. The editors are always happy to publish solid and adventurous work. There is something I now realize I should have mentioned as I answered your first question. Some people reading this interview might wonder, «Haven't I heard of Aesthetic Realism» before, but wasn't it from a very different perspective? The answer may very well be, Yes. Eli Siegel founded Aesthetic Realism in 1942, and for decades he alone used that philosophic terminology. It was very clear to the academic, cultural, educational world that the phrase stood for his thought. In recent years, however, a number of writers have begun using these words in a very different manner: to headline their own academic work. Their aesthetic and intellectual premises, however, are entirely different. To be blunt: this appropriation of the words Aesthetic Realism, in my opinion, is scholarly theft, and it has made for unnecessary confusion. I published a short piece on this matter in the October, 2005 issue of the British Journal of Aesthetics: A Note on Two Conceptions of Aesthetic Realism. I wish I could say that the situation has changed, but unfortunately that is not the case. Over the nearly 75 years since Eli Siegel began teaching his grand and revolutionary philosophy, people have felt the power, truth, and value of his ideas. Another aspect of the theft of Aesthetic Realism is this: rather than acknowledge the source, various people used these ideas as if they were their own. This use without acknowledgement greatly accelerated after the publication in 1955 of Eli Siegel's Is Beauty the Making One of Opposites? in The Journal of Aesthetics and Art Criticism. Were this a different kind of interview, I could give many examples. It is very shameful. That it has also happened in the field of Musicology, I particularly abhor. Now, let's turn to Mozart as a Teacher of Composition. It is a subject full of mystery, yet one which has engaged people since the 18th century. What can such a genius teach to others? And how? Your own writings on this matter are very original. How would you summarize your conclusions as to his pedagogical methods, especially in composition? I'm glad you asked me just to summarize, because the richness of this matter could easily make for hours of discussion. Essentially, I believe that a close investigation of the Ployer and Attwood notebooks prove that Mozart taught chromatic completion to these students. Consciously taught them. I also show in my dissertation that not only are the portions of the Requiem Mozart himself composed based on this technique, but likewise the parts Süssmayr worked on after Mozart's death. I see no way to account for this other than to say that Mozart explained the technique to Süssmayr. We can also see the presence of chromatic completion years later, sometimes decades later, in Attwood's music and Süssmayr's. For example, Attwood's The Prisoner – a musical romance which premiered at the Haymarket Theatre in 1792. Or his Verse Anthem Teach Me, O Lord from 1797. Another example, from 1814, would be his O God, Who By The Leading Of A Star a Collect for Epiphany. For Süssmayr, I'll give just one example: his 1792 Ave verum corpus. Interestingly, it illustrates the technique in a way that differs from Mozart's own celebrated 1791 setting. By means of chromatic completion, emphasis is brought to different words, and this may point to a difference of feeling in the two composers: a different perspective about life, the world, and God. 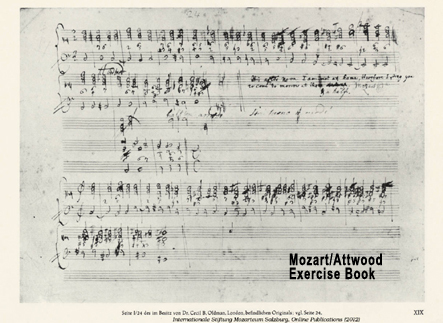 Looking at the Attwood notebooks (see the NMA complete edition: Mozart/Attwood Notebooks): it is striking how Mozart wanted his student to be aware of the full world of chromaticism as rapidly as possible. There are two introductory pages of scale studies – straight-forward and rather dry. But then Mozart plunges immediately into the subject of chromatic harmony. On the very first page of the exercises in harmonization which he presents to Attwood, there are three short progressions. The first requires only a single accidental. The second uses three. The final example makes use of all twelve tones. From then on, nearly every exercise makes use of all twelve tones. Many – not all – are clear examples of chromatic completion. Interestingly enough, it is only after many pages of chromatic harmony that Mozart turns to diatonicism. This pedagogical order – chromatic first, then diatonic – is the reverse of what one would expect. 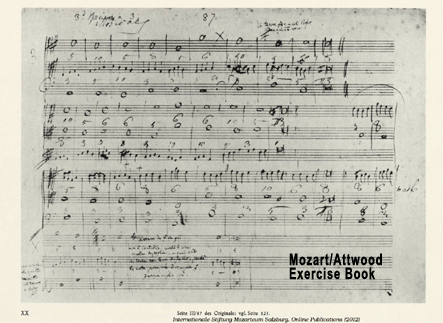 The diatonic portion of the notebook is also the section where Mozart teaches Attwood species counterpoint. Outside the writings of Vogler, nowhere else among Mozart's contemporaries do we see a teacher of composition placing such an emphasis upon chromaticism. Even so, Mozart is unique: he teaches chromatic completion, which is something that can't be found in Vogler. To relish chromaticism is one thing; Vogler had that relish, and he encouraged others to have it through his writings. But it is quite another thing to give to this world of rich and subtle tonal diversity, a clear structural design. That is what chromatic completion does: the unfolding of the 12 tones is felt as a single arc of sound. Its point of completion matters, emotionally and dramatically. There is, in effect, a trajectory towards it. And without going into detail, let me add that chromatic completion is not only evident in the Ployer notebooks, it is also prominently employed by Mozart in the piano concerti he wrote for her. Since you mentioned G.J. Vogler, you are one of the very few scholars who has systematically studied the theories concerning chromaticism of that most mysterious Abbé, and how these theories affected the work of Mozart, and through Mozart, Haydn. What did you discover? Well, I spent over fifty pages on this matter in my dissertation. It was, in fact, the concluding chapter. I hope people who want a detailed answer to your question will look there. Meanwhile, I'll try to say something useful here. Vogler was the first theorist to posit the independent reality of the chromatic scale; even to suggest its primacy. Before him, it was seen simply as a set of inflections to an underlying diatonic scale. Paula Tedesco writes valuably about all this in her essay Forward-Looking Retrospection: Enharmonicism in the Classical Era, in vol. 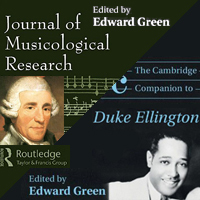 19 of The Journal of Musicology. It wasn't so much Vogler's compositions which inspired Mozart, because, as is well-known, he spoke in a very slighting way about Vogler's creative gifts. So slighting that Leopold Mozart chastised his son, saying there was much Wolfgang could learn from Vogler. The fact that Vogler would later become the teacher of both von Weber and Meyerbeer supports Leopold. Even so, the encounter Mozart had with Vogler in Mannheim in the winter of 1777-1778 was a turning point in his musical life. In those weeks, and the months immediately following, Mozart tried to come to grips, in a creative manner, with Vogler's theories. He began to write composition after composition in which chromatic completion was present. This was not true before the Mannheim experience. Nor would Mozart, having once added the technique to his compositional palette, ever forsake it. Haydn's path was different. While Mozart was ablaze in the late 1770s and early 1780s with the systematic use of aggregate completion, Haydn in those years appears to have shown only intermittent interest in the technique. Then, suddenly, it's very different, and chromatic completion becomes a constant, central feature of his music. In the years of his close friendship with Mozart: the mid and late 1780s. 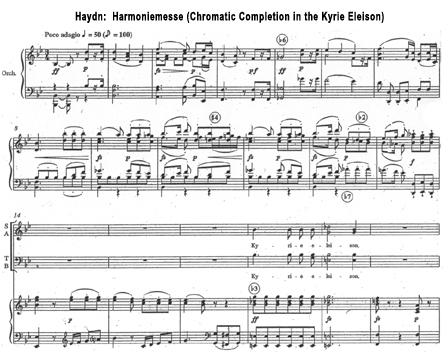 The implication is that Mozart's enthusiasm for chromatic completion helped to spur Haydn's. This, of course, is speculation – informed speculation, I trust, but speculation, still. There's no direct documentation to support it, other than the scores of these two great composers, and the chronological hints they offer. Yet since we have strong evidence that Mozart taught the technique to his students, it is more than likely he also spoke to Haydn about it at that time. Switching perspectives: We know that many jazz musicians have been magnetically attracted by the music of J.S.Bach, and also by other great classical masters of Europe, including Mozart. Thanks to your long experience as a teacher not only of the European classics, but also of jazz – and, in particular, your well-known studies in the music of Duke Ellington – can you tell us what, in your view, are the profoundest links between the classical music of Europe and jazz? Where and how, for example, do Haydn and Mozart relate to Ellington? And since you are also a concert composer, can you tell us how you feel, in your own creative work, you've been indebted, and grateful, to Haydn and Mozart? The deepest relation between European classical music and jazz is the one I pointed to earlier: as we listen to instances of music from around the world – from many centuries and from divergent cultures – no matter how different these musical examples sound one from the other, they all arise from the same inevitable and beautiful impulsion: to put opposites together. There are many opposites I could talk about, but let's start with freedom and order. A large reason people love jazz has to do with this. In jazz, there's often a solid groove simultaneous with the unexpected twists and turns of inspired improvisation. Do we also experience order and freedom, stability and surprise, in the best examples of music from the Classical Era? We sure do! The technique is different, but the emotional impact is akin. And since you asked about Bach, I've often used his Passacaglia in C minor as a way of showing jazz majors how close his way of creating variations over a repeating bass is to certain effects in the music of Miles Davis. But that's just one example; there is so much in Bach that is near to jazz – including the unprepared use of flattened 7th blues tones, as, for example, in Bourrée II of the A minor English Suite. Another strong connection between jazz and the music of the Classical Era is that they each deal, in their own way, with the world as rough and smooth. 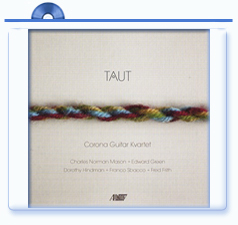 We hear these opposites in the timbres of jazz as well as in its blues-drenched harmony. Haydn doesn't use harmon-muted trumpets; Mozart doesn't write 12-bar blues – (though he does have a liking for dissonant cross-relations). But who can hear the 104th Symphony of Haydn, or the 40th of Mozart, without having a thrilling, satisfying, surprising, and beautiful experience of roughness and smoothness? You asked about Ellington. Thank you! I see him as America's greatest composer. «a good case can be made that, all in all, Ellington... was the most influential composer of the twentieth century... for jazz, with its various stylistic offspring, has had more impact worldwide than any other form of modern music. And Ellington is acknowledged almost universally as the greatest of all jazz composers». «In Ellington's masterpieces - compositions such as The Mooche, Harlem Air Shaft, East St. Louis Toodle-O, Jack the Bear, and Concerto for Cootie - we meet vibrant energy and deep thoughtfulness, passion, and control. Again and again, his music swings with intensity, yet also with natural ease. Just think, for example, of Cotton Tail. Opposites are convincingly, beautifully together... joined in a way we hope they can be in our own lives. There are, in Ellington's finest works, a true composition of roughness and velvet smoothness; a sense of the orderliness of the world and its confusion. Sounds are heavy, yet also winsome in their lightness. Sounds are wide, but also edgy; painfully thrusting, yet also lovely, suffusing, tender. There is surprise after sonic surprise; at the same time, there is the beat and an unshakable continuity of musical design. We hear poise, elegance, sophistication; we are also in the presence of a sincere, primitive wildness that comes straight from the gut. If you care for Mozart, Haydn, or any other composer of the Classical Era, you can ask: do I love them for similar reasons? I think the answer will be, Yes! 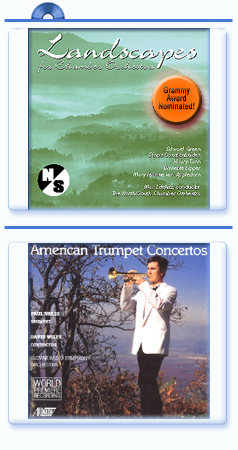 In terms of more narrowly defined technical links between jazz and European classical music, let me mention one which I think has gone under-appreciated. It has to do with motivic development, which everyone knows is a central thing in Haydn and Mozart, and also with Schönberg's concept of Grundgestalt. What is not often realized is how central these principles are in jazz; certainly in Duke Ellington. In 2008, I published an essay in Jazz Perspectives with the purposefully humorous title: It Don't Mean a Thing If It Ain't Got That Grundgestalt! – Ellington from a Motivic Perspective. You also asked about the impact of Haydn and Mozart on my work as a composer. I've learned so much from them, I couldn't possibly say it all. I'll just point to some major things. From Mozart, I've been awed by how simple, clear, straight-forward he is, and yet how subtle. One aspect of this, which has affected me greatly, is his way with rhythm. I can't think, in fact, of a composer whose underlying rhythmic structures are at once so syncopated and subtle, yet balanced, coherent, and graceful. I'm including Stravinsky when I say this. Consider his Piano Sonata, K.311. It opens with a seven-bar phrase: 3 + 4. We don't notice that irregularity at first because the first sub-phrase dovetails with the next in measure 4. As a result, we get a conclusion and a beginning at once. Similar things happen throughout the sonata. Similar things happen everywhere in Mozart. 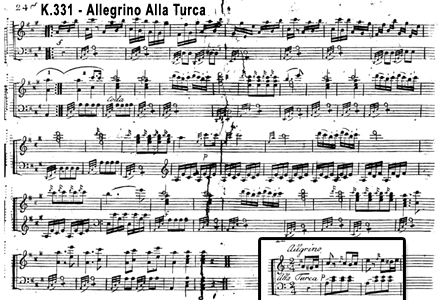 Another delightful instance of symmetry and asymmetry can be heard in the coda of his Rondo alla Turca. There are 6-bar and 7-bar phrases; some with and some without dove-tailing. Children love this music. I know I did; I remember loving it when I was 10-years old, maybe earlier. Everyone wants to feel secure and yet be delightfully taken by surprise. This music meets those desires. Another astonishing example of Mozart's superb way with rhythm is in the Overture to Der Schauspieldirektor. Its opening phrase is 6 measures long. In terms of dynamics, it is divided neatly in half: three bars forte, and then three bars piano. Yet in terms of motivic structure, the same 6 measures are divided not in two parts, but in three: there are three 2-bar phrases. The design is A, B, B'. I'm not sure I've ever seen any other composer do just this. One place where my Mozartean education is easy to hear is the Gigue to Music for Shakespeare, an orchestral suite you can find on the same URL I gave earlier for the concerti. The Gigue is in 11/8 – so while it's meant to evoke that older style of dance music, it's clearly modern at the same time. Of course, old and new are opposites everyone is always trying to make sense of: the past and the present. But the big thing, in terms of Mozartean impact, is that as the Gigue goes on, the grouping of beats constantly shifts. The Gigue starts with a one-measure phrase organized 2+3+3+3 = 11. The next measure is similarly organized. But the third phrase spills beyond the limits of measure three. That phrase is 2+3+3+3+ 2; adding up to 13 beats. As a result, the fourth phrase is just 9 beats: 3+3+3. In keeping with the opposites, this last phrase is the shortest of all, but it also ends with a fermata – so it's likewise the longest. Well, it takes longer to describe all this than actually to hear it! And, I hope, enjoy it. What is your favorite work by Mozart? By Haydn? And can you give some of the technical and aesthetic reasons? A hard question, because there are so many works I love with all my heart. I can only tell you what first comes to my mind. For Mozart, it's the 41st Symphony. It brings together two very different ways – in fact two very contradictory ways – people can be. I see those ways in myself, and often, to be honest, they don't blend as well as I would like. But in the Jupiter Symphony, they make a one. Here's what I mean. The first two measures of the symphony are thrusting, powerful, drum-like. Sudden silences sharply separate musical figures from each other. We seem to be hearing a self which is assertive, decisive, fiercely confident. A self, even, in a military mode – what with that evocation of drums. The dynamic is forte, and the entire orchestra plays in octaves, asserting the tonic again and again. I've got this in me: this assertiveness; this desire to be decisive. Everyone does in his or her own way. Then, how utterly different the next two measures are! They are quiet. We hear only the strings; moreover, the heaviest of the strings – the contrabass – is absent. Unlike what came before, there are no sharply etched silences here; the music is entirely legato. And in contrast to the open octaves, now we hear rich harmony, softening the atmosphere. The melody in the first violins sighs sweetly in a rising series of appoggiaturas. And this second two-bar phrase ends not on the solid tonic, but on a yearning first inversion dominant seventh chord. A beautiful question seems to hangs in mid-air. And in the hands of a lesser composer, what a chance for incoherence. It's the kind of thing, in fact, Mozart made fun of in Ein musikalischer Spass: music which has all kinds of contrasts, but no real coherence. The wonderful thing about the opening of the Jupiter Symphony is that both from a technical and an ethical point-of-view Mozart sees the relation between these two ever-so-different ways of mind. The forceful self and the tender, gentle self, the decisive self and the yearning, questioning self, are working as one. How does Mozart do this? Through an implied beat which we hear all the way through these four measures. It is made up of a dotted quarter followed by an eighth. Drum that pattern out as you listen; the dotted rhythm connects everything. We feel through this background rhythm that as contradictory as these states of mind are, they belong together and help each other. «Every person,» Eli Siegel once said, «is always trying to put together opposites in himself.» Mozart illustrates this – and how beautifully! For Haydn, let me say that the aria Mit Würd und Hoheit angetan from Die Schöpfung has been a favorite of mine for decades. I first met it when my High School Chorus in Jericho, Long Island did selections from the oratorio. The aria celebrates marriage as the completion of one self by another self. It begins in a very masculine manner as the archangel Uriel (who is singing) describes Adam. The rhythms are sharp, and the music, over-all, is forceful. Then, as Uriel tells of the arrival of Eve, the aria shifts to a more feminine mode: more flowing, sweet, graceful. The contrast couldn't be clearer, yet it's all one continuous melody, and the progression seems natural and inevitable. We feel Adam is completed by Eve – a musical expression of the success of love. Aesthetic Realism defines love as Proud Need; we hear that in Haydn's music. I'm very grateful, too, to say that my own happy marriage was made possible through studying Aesthetic Realism and this great definition of love. I am proud to need my wife, Carrie Wilson – glad that she represents the world different from me. Through her encouragement and criticism, I see the world, music, and people better. Carrie is a consultant to women on the faculty of the Aesthetic Realism Foundation, and the instructor of the course The Opposites in Singing: Technique and Feeling. She is also an important critic of the visual arts, and a fine actor and singer. Is there a neglected composer of the 18th century you'd like to see re-evaluated? And – whether by this composer or another – is there a neglected piece of music of the 18th century you'd like to see performed in concert with more frequency? I'd start with Joseph Martin Kraus. He's 1756 to 1792, almost an exact contemporary to Mozart. His symphonies, in particular, are important. I'd like to thank Dr. Bertil van Boer for first drawing my attention to this fine, almost entirely forgotten composer (B. van Boer at Academia). Going a bit into the early 19th century, I'd point to Anton Reicha's cantata Lenore. It's hardly ever performed, yet has real emotional and dramatic power. Given Reicha's teenage friendship with Beethoven in Bonn, and also their relations with Haydn in Vienna, it would be easy to imagine that this 1806 work uses the same text as Beethoven's 1805 opera carrying the same name. But no: Reicha's text is the 1773 Sturm-und-Drang ballad of Gottfried August Bürger. Reicha published, just on the edge of the 18th century (1800) an extraordinary set of Twelve Fugues. Nothing more radical ever happened to fugal form. There are experiments here which seem positively 20th century: a polytonal fugue; a fugue in 5/8. Yet the wonderful thing is not, per se, the astonishing experimentation; it is that these fugues are good, musically. As we know from a good deal of 20th and 21st century contemporary music, there are lots of musical experiments about which that can't be said. Daring experiments, but dull music. So along with Kraus, I feel strongly that Reicha is a person who demands to be better known. Not just as a composer; also as arguably the most successful teacher of composition ever. Among his students were Berlioz, Gounod, Liszt (to a degree), and then also Adolph Adam and Caesar Frank. Wow! Finally, a word in support of Rousseau as composer. He's better than many people have realized. I wrote about that in a piece for Vol. 16 (Winter, 2007) of Ars Lyrica: Reconsidering Rousseau’s Le devin du village—an Opera of Surprising and Valuable Paradox. As for his impact on musicology, which was considerable, there's his pioneering work to have Europeans respect music from other continents. I wrote about that in an essay included in Music’s Intellectual History, a 2009 volume of the RILM Perspectives Series, titled The Impact of Rousseau on the Music Histories of Burney and Hawkins. Have you read a particular book on the Mozart Era which you consider particularly important for the comprehension of the music of this period? Feel free to mention more than one! Here, I have to be very selective, since there are dozens of excellent books on the Classical Era. I have always admired Donald Francis Tovey's essays on Haydn, Mozart, and Beethoven. Charles Rosen's books... The Classical Style and also Sonata Forms – I have learned from deeply. That is true likewise for Leonard Ratner's Classic Music, as well as his book on the Beethoven String Quartets. Kerman's book on the quartets is also excellent. I care very much, too, for Julian Rushton's fictionalized, but lovingly rendered portrait, Coffee with Mozart (J.Rushton at Academia). Wye Allanbrook's Rhythmic Gesture in Mozart made everyone take fresh notice of the importance of dance rhythms. Robert Hatten's books (R.Hatten at Academia) are very valuable in understanding the hermeneutics of the period, as is Robert Gjerdingen's A Classic Turn of Phrase (now available also at Gjerdingen's Academia Site: e-book A Classic Turn of Phrase). Of course, to study Haydn is also to read H.C. Robbins Landon. His books are still the foundation for Haydn research. Another work I love – though this brings us more into the early 19th century – is Rudolph Reti's Thematic Patterns in Sonatas of Beethoven. You asked earlier about the relation of jazz and the music of European classicism; Reti's book provides a solid methodology relating composition and improvisation, seeing them as aspects of a single creative drive. This makes it invaluable to anyone who is interested in seeing the common thread between these two very different kinds of music. Reti's book, as you likely know, bases itself on Schönberg's idea of the Grundgestalt... and I've already indicated how important I think that concept is. I'm sure I should be mentioning other people. That I haven't is not, in any way, meant as a slight. There just isn't time. And – of course – it's crucial that scholars dig into the theoretical texts of the time by Koch, Riepel, Vogler, and others. The single writing which has most deeply affected how I see the Classical Era is Martha Baird's essay Some Opposites in Mozart, Con Amore. In it, among other things, she shows how important it was to Mozart – as a man as well as composer – to make a one of anger and sweetness, force and tenderness. She illustrates this through his Symphony #32, Belmonte's O, wie ängstlich and Osmin's Solche hergelaufne Laffen. She also writes in that essay about the Fifth Violin Concerto – the Concerto that has the famous Turkish interruption of its Tempo di Menuetto finale. I spoke earlier about the fierceness and tenderness, the assertiveness and sweetness of the Jupiter Symphony. I'm sure it was the impact of Martha Baird's essay that made it possible for me to see something of what Mozart accomplished there, and its deep human significance – including personally for myself. Martha Baird was the wife of Eli Siegel, and a scholar with original insight on many aspects of music. I love, for example, her papers on Verdi's Aida, and on the perennial philosophic question of the relation of Absolute and Programmatic music. This was titled What Is Music About? During the years I studied with Eli Siegel, I likewise studied with her, and I cherish it. Never did a critic write about music with such a combination of ease, naturalness, and solid intellectual rigor. And is there a movie or a documentary film which you feel can likewise benefit people in the comprehension of this music? After my enthusiastic listing of many authors whose work I value as to the Classical Era, I don't want to seem ungenerous and chary as I answer this question. But, largely, I've been disappointed in the movies and documentaries I've seen. Two which I've felt were useful as introductions to Beethoven when I taught non-music-majors were the BBC biography of the composer, and also Michael Tilson Thomas' engaging film on the Eroica – though, at times, it is a bit idiosyncratic. I would love to see a full-length film on the life of Haydn, or Mozart, or Beethoven that does them justice – as men and as artists. To my knowledge, none have yet appeared. Finally, is there a special place you think scholars of the Classical Era, and lovers of its music, ought to visit to gain crucial insight into the evolution of the musical 18th century? Certainly, as cities, Vienna and Paris are the most important. When it comes to libraries, I'd have to say the great Bibliothèque nationale de France in Paris. But speaking personally, nothing did more to sharpen my sense of the 18th century as a whole and its music than visiting Versailles and Schönbrunn. There's such splendor there, but then you realize the horrific cost of that splendor – the evil of aristocracy which made it possible. All that wealth for the benefit of a very small group of people: wealth gotten by grinding millions of others in awful poverty! Walking through those palaces, I had a vivid, gut-grabbing sense of why the 18th century led inevitably to the French Revolution. If we want to have the Classical Era truly in our minds, nothing is more important than understanding the forces – intellectual, political, economic, and ethical – which led to the great event of 1789. Thank you for these questions. It was a pleasure to try to answer them.